is about life in TEXAS along the Brazos River. and drains water from only TEXAS. A history of life along the Brazos River. This is a page of links. Each link tells a story or describes the early settlers lives in Fort Bend County, Texas. Fort Bend is the county just southwest of Houston, Texas. Early communities are listed by name. This is the history of Fort Bend County, Texas from the early Angelo American settlers arriving in early 1820, their troubles with nature, with Mexico and the fighting for the Republic of Texas. Emphasis is on the efforts of particular individuals. There are towns [communities] listed because they existed and some of those listed don't exist today. A history of floods on the Brazos River including a trip on the flooded Brazos River and Brazos River historical flood articles. use your browser's BACK button to avoid closing this web site. Class Designations for Settlers Land was awarded based on the performance of settlers. Mexican Texas Contains information useful in understanding the political climate of early Texas. Texas History Timeline Important events and their dates. Run Away Scrape by Delue Harris Leaving Texas ahead of Santa Anna is told by a participant. The Texans Win Independence Battles won and lost, plus what defeated the Mexican Army. The shape of the Republic of Texas The boundaries of the Republic of Texas by the comprise of 1850. Duke, Texas Ghost town [marker] is the story of a ghost town in eastern Fort Bend County, Texas. .
UNITED STATES LIFE-SAVING SERVICE of Galveston about the July 1899 flood. Baptist Church Formed in 1870 by freed slaves this is the oldest Black church in the area. Arcola Plantation for sale in 1908 is a prospectus for the sale of the plantation. There are black and white photos of the operating plantation.This is a 26 page presentation. Sienna Plantation Owner from 1950 to the Present. 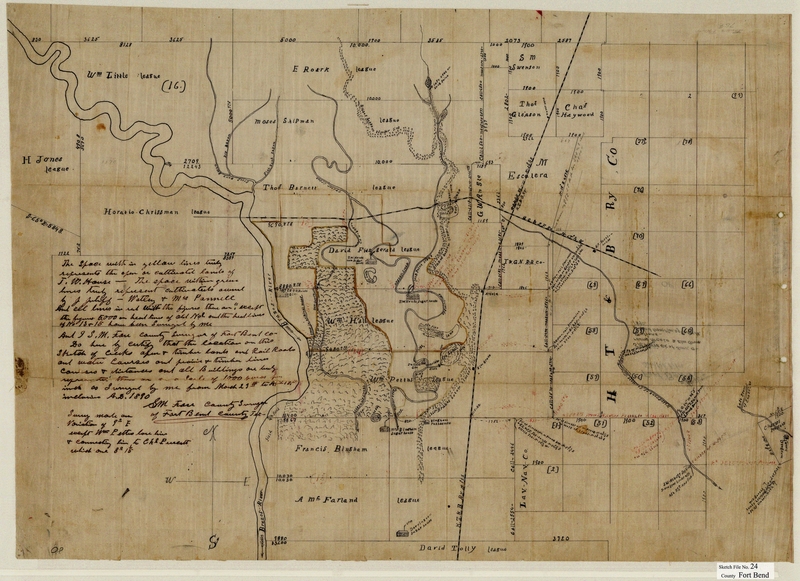 Subdivided by the Johnson Corp.
1890 Sketch [Map] of the plantation area. Plantation Photos Today are color photos of what remains today. Read the complete story about a steam engine. 1861 sugar mill steam engine. Read about the Osceola Plantation in Brazoria County Research paper. Brick barn next to the steam engine. This barn is made from homemade brick. Dew Plantation Plantation home built about 1900. Floods on the Brazos River uses Rosharon, Texas [FM 1462 crossing of the Brazos river] as a guaging point for historic water levels. This page has a history of some major floods in Texas. See photos of the Brazos River in minor flood stage. Page starts with an Airplane shot of the Brazos River at low water for comparison to the water level in minor flood stage. The trip tarts at Juliff and continues upstream to HWY 90A it Richmond. Death of a grave is the story of the tombstone of Lola V. Harris. Starting with color photos taken in 2004, followed with research to discover her identity, the disrespect shown by a major subdivision home builder and communications between the Fort Bend County Historical Commission and the home builder trying to discredit her burial location. Bass Bites Rattle Snake A dangerous bass fish bait. A 32 DAY TRIP from Honey Hole Magazine - Aug/Sept/Oct 2002 issue. A trip on the Clear Fork of the Brazos River from Abeline to Possom Kingdom Lake.